Google and Uber are building self-driving cars, it’s rumored that Apple is going to be building self-driving cars, Tesla has launched driver-assistance features, and many traditional auto manufacturing companies are advancing their features to include driver assistance and, eventually, automation. Ride sharing and car sharing pave the way for the self-driving car industry. Ride sharing startups, like Uber, Lyft, Sidecar, BlaBlaCar, and car ownership-sharing, like Getaround, DriveNow, Car2Go, RelayRides, and Zipcar are paving the way for this market. Society is learning we don’t need to own a car to complete our journey, increasing the demand for this new product. Yesterday, at a Silicon Valley Forum event in Palo Alto, experts predicted that self-driving cars will be rolling out within 5-10 years, which is just about the time car payments will end on any recently purchased cars. Also, keynote speaker, Stanford’s Stefan Heck shared this stat: “The leading cause of death for 25-40 year olds is human driven cars”, demonstrating the market need for safer and effecient transport. The potential impact to society is staggering. I’ve outlined the findings below. The four phases of self-driving car development suggest we’re 5-10 years out. The Personalized Car event, hosted by SVForum was held on illustrious tech-centric Sand Hill Road in Palo Alto, with speakers from Stanford, BMW, consulting firms, investors, inventors, entrepreneurs, and forecasters. Four states currently allow the testing of self-driving cars, including California, Florida, Michigan, Nevada, as well as the District of Columbia. 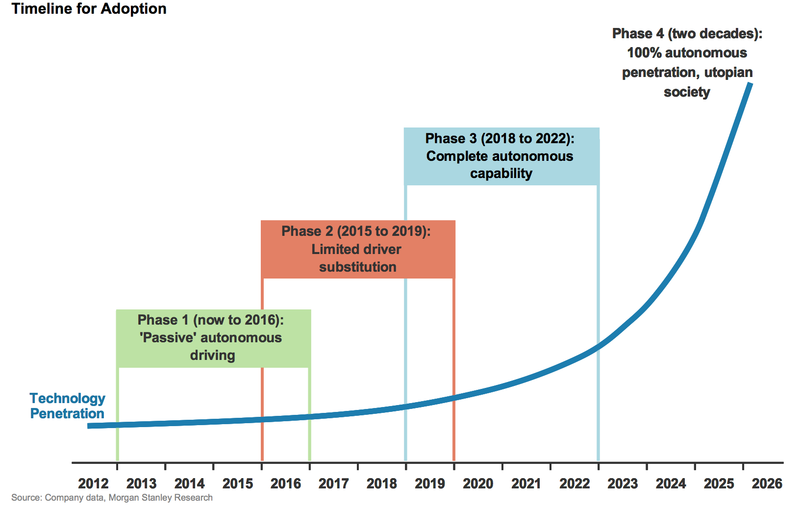 The speakers discussed the four phases of self-driving car automation (see maturation chart, courtesy of Morgan Stanley, below) at the most basic-level, driver-assist features, like Tesla’s autopilot. The second phase, which we’re in now, is where cars can self-drive along with human fail-safes, like the Google self-driving car I see whizzing around Silicon Valley. In the next phase, we can expect to see cars transporting people, without assistance. In Phase 4 the need for human drivers will be eliminated altogether. Above: The event verbally cited these four phases of car automation. Taxis compete with Uber, Google, Apple self-driving cars. Ride sharing was just the first blow. Ride sharing drivers at Uber, Lyft, Sidecar, BlaBlaCar will be disrupted as autonomous cars do a safer job at lower cost. Local couriers, like TaskRabbit, Instacart and bike messengers will be impacted. Mid range and long range transportation and delivery services would be impacted as local delivery becomes automated. Retailers may see a change in foot traffic as people order goods to be delivered to their homes by driverless cars. Auto and life insurance should be impacted, due to fewer accidents and the introduction of per-mile-based insurance. Paramedics may be impacted if victims choose self-driving cars to whisk them to ER for less than severe injuries. Car ownership could dwindle. Self-driving cars means fewer cars will be needed, as they’re efficiently routed as needed. Airbnb may benefits as urban areas convert garage spaces into living areas for short term stays. The parking industry could suffer, as lots are converted to other uses. Parking fines and local taxes could dwindle with fewer cars on road and robotic efficiency. Radio and podcasts could become less popular, as people play video games and watch videos in the self-driving rides. Short distance airlines could suffer, as people choose to take a relaxing trip in a mobile living room. Communities or attractions not connected by rail could prosper as people easily travel there for business or pleasure. Auto repair could be impacted as self-driving cars automatically head for maintenance without the driver or owner present. Hotels and motels could be affected as families are able to sleep in the comfort of a self-driven vehicle on the way to their destination. Leave a comment, below, on who else might be disrupted. I’m on the advisory board of Sparks & Honey, an agency based in NY that looks at future trends and their impacts on society. They recently published this SlideShare, below that shows the impacts of self-driving cars on logistics, retail, culture, and even our love lives. Their list of disruptions goes far beyond what was mentioned at the event yesterday. Also, I captured notes from the event in real time on my Facebook feed, which you can read, along with community reactions. Impacts to Business and the Crowd. My current focus is on the Collaborative Economy, how the crowd obtains resources directly from each other, using commonly available technology. The key finding is that the startups in this space will also need to adjust their business model to adopt automation and prepare for people to be slowly eliminated from the driving process. Given that Uber is indicating that they’ll be creating self-driving cars and that Google will be adding ride-hailing apps to summon their self-driving cars, we can see how this is already coming to fruition. Get ready for more disruption, led by technology. To prepare us for this next phase, I’ll continue to cover this topic from time to time, based on what I see and learn. Update: The day after I posted this, Volvo announces they’re releasing a self-driving car, by 2017, in just two years. Hat tip Lisa Woods. There’s more discussion about this article on Linkedin, and on Facebook.